Used for large scale waste management and renewable energy generation, anaerobic decomposition works slowly, without oxygen. Here’s how to do it at home. Anaerobic composting requires an entirely different set of organisms and conditions than does aerobic composting. The anaerobic process, which is essentially putrefaction (sorry, but there it is), produces a very acidic environment similar to that in the stomach. Hence the term “digester” used to describe anaerobic processes and to distinguish them from aerobic composting. Actually, the stomach still holds the prize for acidic environments. The pH in an anaerobic digester might dip as low as four but that in the stomach is between one and two. Both anaerobic and aerobic decay produce heat as a by-product. The temperatures in an aerobic system can become hot enough to kill pathogens or weed seeds. Those in a digester cannot. However, the digester’s acidic environment itself eventually does the trick. Eventually is the key term here. The inhospitable environment takes six months to a year to kill off dangerous microorganisms. The easiest and quickest way to make rich, “garden gold” for your vegetable plot is with a compost tumbler! There’s no heavy lifting needed to turn your pile… just give it a quick spin. Our wide selection guarantees you’ll find the right size and style for your needs. Best of all, most are shipped free! There’s a second advantage to waiting a full year before using the compost from a digester. Fresh anaerobic material — feedstock that has gone through the initial phase of digestion but hasn’t sat for months afterwards — is so acidic that it cannot be directly applied to plants. Nor can it be dug into dirt where it might come into contact with plant roots. Before it is safe to use, it must go through an aerobic phase that lasts about a month to neutralize its pH. Material that has digested for a full year should be safe for the garden — and it will smell much better. For this reason, it’s best to have two bins going. When one is full, you can close the lid on it for a year while you deposit waste in the other. By the time you open the first bin, all pathogens will be dead and the composted material will be ready to use. The simplest anaerobic composter is a plastic bag filled and left in the sun. Most consist of a container with just a single compartment, either placed on cement blocks with a vessel underneath to collect the leachate, or partially buried in the ground. The leachate from a buried vessel will fertilize the nearby soil. Sinking the bottom of the digester into the ground slows the rate at which leachate drains out of the feedstock and ensures that the contents do not dry out. It also gives worms and other soil organisms access to the contents of the digester, though many will only feel at home after the bottom layer of material has passed through its most acidic phase and the pH starts to level off. Finally, burial helps control odors and makes it almost impossible for pests of any kind to gain access to the bin’s contents. As with aerobic composting, different methods yield different composting times. The throw-everything-in-a-plastic-bag method mentioned above is roughly equivalent to building a hot aerobic pile. The basic composting is accomplished within a few weeks if the container is in hot sun. A barrel or digester to which you continually add material is more like a slow pile. The stuff at the bottom forms mature compost while the stuff at the top isn’t compost at all. Material is added to a continuous pile and a barrel digester in the same way. But the compost is harvested differently. With a continuous aerobic pile you throw yard waste and food scraps on top and pull compost out the bottom. There’s no easy way to remove the finished compost from the bottom of a digester. It’s just too wet and sloppy. This is why you eventually need to put the lid on an aerobic system and walk away. This also explains why it’s best to have two bins: one to add to while the other digests. With an anaerobic system you can say good-bye forever to turning compost piles. That’s all some people need to hear; they’re instant converts. True, rolling plastic bags filled with weeds or grass will speed up the process, but it’s not necessary. Short-term anaerobic compost does need to be dug into fallow soil, where smells dissipate and pH normalizes, before it can be planted. If the material is left in the digester for a year it will be ready to use right out of the bin. This is accurate but misleading. We can smell the aerobic pile because it’s open to the air. But anaerobic composting takes place in enclosed containers which shouldn’t smell. It’s true you’ll get a whiff whenever you lift the lid to add new material. But even that can be eliminated by commercial digesters, most of which come with a bag of enzymes that speed decay and help eliminate odors. You can try these enzymes with home systems or just sprinkle some earth over each new layer of material. Quick aerobic compost will still smell pretty awful when it’s exposed to the air which is one reason why it needs to be dug into earth as soon as possible. Slow compost shouldn’t have much smell at all by the time you open the bin. The various pests that can be a problem in piles are generally a non-issue with anaerobic systems simply because they’re enclosed. Also, the acidic environment is far from inviting. This means that you don’t need to worry about seeds or pathogens that arrive via deer or bird droppings, nor about the mess a bunch of crows or magpies (not to mention a single fox or raccoon) can make of an open pile. Insects, however, can be a problem. There’s nothing quite like opening the lid of a digester and being engulfed in a storm of flies. A downloadable Santa Barbara County document on anaerobic composting (PDF) names two very different — indeed, opposite — conditions that can lead to an excess of flies. Fly Parasites are nature’s first line of defense against nuisance flies — including the common housefly. The female predator seeks out a host pupa, drills through its cocoon and lays several eggs inside it. 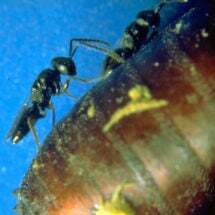 The resulting parasitoids kill the pupa by consuming it. This is one of the biggest differences between aerobic and anaerobic composting: meat is strictly forbidden in aerobic systems, but not in digesters where at least some experts say that small quantities of meat are not a problem. However, in introducing animal products, one also risks introducing pathogens which break down more slowly in anaerobic than aerobic systems. If you do put meat in your bin, be sure to let it sit for a full year so that any pathogens can be eliminated by the acidic environment. Very oily, fatty foods, including margarine, mayonnaise, fatty meat scraps and vegetable oils, should not go into a digester. They’re too much for any composting system. Compost piles can handle large quantities of carbon-rich material such as dead leaves, straw and even pine needles. Digesters are primarily designed to break down kitchen wastes and green yard waste. Grass trimmings are fine. In an anaerobic system, you don’t have to mix them with other materials or spread them out so that they won’t turn into green slimy mush. In fact, that’s exactly what you want them to do! 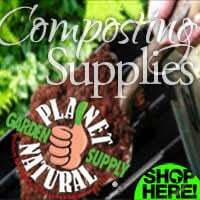 Green leaves, weeds, old plants and all the usual garden refuse can safely be put into an anaerobic digester in small quantities, but not large quantities of woody hedge-trimmings, wood chips or piles of weeds complete with roots. The length of time depends on weather, location and a number of other factors. As mentioned above, if you fill a container, set it in the sun, and leave it undisturbed, the initial phase is complete in just a few weeks. However, anaerobic decay proceeds quite slowly. It takes up to a year for pathogens to break down under oxygen-free conditions. After a year, the original feedstock will be unrecognizable, odors will have dissipated and the compost is ready to be used anywhere in the garden. Anaerobic decay is harder on the environment than aerobic. When organic material breaks down in the presence of oxygen, the primary by-products are water, heat and carbon dioxide (CO2). CO2, of course, is a greenhouse gas that contributes to global warming. But anaerobic decay produces methane (CH4), a far more potent greenhouse gas. In fact, pound for pound, methane is twenty times more damaging to the environment than is carbon dioxide. Select a sunny site with good drainage. Sunshine helps raise the bin temperature and keep the microbes happy. Drainage is crucial to ensure the correct moisture level. If you have only heavy, clay soils, build a mound of dirt incorporating plenty of pebbles and situate your digester on top. If your soil has good drainage, locate your digester where the leachate will nourish plants, and where you won’t have too far to trek from the back door. Since it’s best to limit the number of times that the bin gets opened, you’ll need a pail to collect several days’ worth of kitchen wastes. If you have purchased a commercial digester, be sure to read the directions and follow them carefully. Be aware that if you are using your digester to process pet wastes it is NOT a good idea to situate it near any vegetables or herbs. Home-built systems can be either large-scale or small-scale. The large-scale systems require a barrel, trash bin or any large metal or plastic container as long as it hasn’t been used to hold toxic substances. 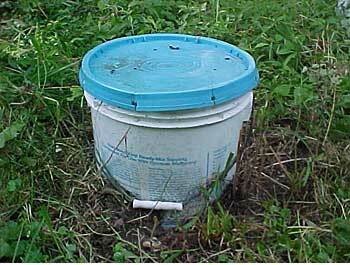 Small-scale systems can use a receptacle as small as a pail as in the photograph above. The one absolute requirement is that the receptacle must have a tight-fitting lid. Digesters produce large amounts of liquid which needs to drain away. The first step in building one is to drill holes in the bottom or even remove the bottom completely. In sandy soil, holes will probably suffice. In heavy soil, an open-bottomed container will more likely provide adequate drainage. 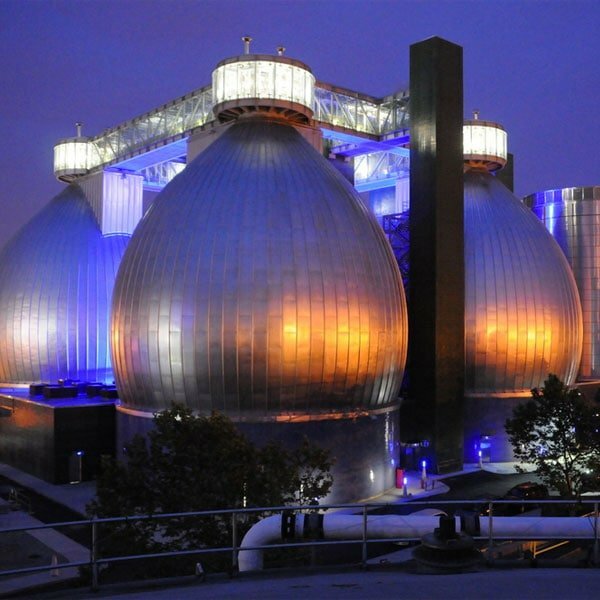 Opinions differ about how deeply a digester should be buried. One site says that a pail need only be an inch deep. But most advise burying half the vessel in the ground. If your soil is sandy, all you need to do is dig the hole and set the digester in place. If you have heavy soil, it’s best to dig out several inches of soil below and around where the receptacle will sit then add pebbles, very coarse sand and organic matter to the soil. To prepare the hole, return twice as much of the amended soil as you removed. If you dug the hole three inches deeper than you need it, put back six inches of amended soil and tamp it down. As it settles, it will pack down to not quite the original height of three inches. The amendments help create a small, slightly raised and better drained mound. After filling the hole, set the receptacle in place and use the remaining soil to fill the hole around it. You’re ready to go. For an above-ground digester, start by drilling holes in the bottom of your bin or barrel. Position them several inches in from the rim. Set the can or barrel up on cement blocks and slide a pan or container, 3-4″ deep (an old wok works well) under the center of the barrel to collect the leachate that will drain out of the decomposing material. Don’t worry; these holes won’t let in enough oxygen to interfere with the anaerobic process. Depending on the setup, pulling the pan out without spilling its contents can be challenging, even impossible. If that’s the case, use an old chicken baster to remove the leachate. This one is real hard. Throw everything green (grass clippings, leaves, kitchen waste) in a tough plastic bag, filling it perhaps 3/4 full. Press out any extra air and put the bag in the sun for several weeks. Voila! The resulting compost is messy and smells but it’s fairly quick and very easy. Make sure you use a strong plastic bag! If it breaks while you’re trying to carry it to its designated site, there will be no way to scoop up the contents because it’s mostly liquid. Pails and barrels can be filled with waste as it becomes available. Remember to avoid large quantities of browns such as fallen leaves as digesters are primarily designed to handle kitchen scraps. When the vessel is full, cover it firmly and leave it for two months for quick compost, or a year for fully digested compost. When all goes well, the only attention required by an anaerobic system is that at some point you stop adding material to it and let it alone. This down time gives the most recent additions a chance to decompose. It helps if you stir them into the contents of the bin before closing the lid. Opening the lid lets in fresh air and oxygen which interferes with the anaerobic conditions that promote decay. For this reason, it’s best to limit how often you add scraps to the bin. Once or twice a week is best. Anaerobic systems need very little maintenance, but they should be checked regularly (once a week or so) to make sure that everything is going as it should. Warning signs include excessive numbers of flies, evidence that scavengers have been digging around the base of the bin, and a failure to compost. Material Not Composting: You’ll know this is a problem if the pile continues to mount instead of staying fairly level. If the feedstock doesn’t settle and pack down, one of three things is wrong: the mix is too dry, it contains too much high-carbon material, or there’s too much oxygen in the mix and around it. Sometimes these conditions occur together — woody materials absorb moisture and can trap oxygen — but not always. — Make sure the material is wet; moisten it if necessary. — If the bin contains too much high-carbon, woody material such as dry leaves, wood chips or pine needle, moisten it and add a healthy dose of high-nitrogen material such as grass clippings or table scraps, especially fruits and vegetables. — If the feedstock seems damp enough and doesn’t contain much woody material, the problem may be too much oxygen. This is often the case if you have a small amount of material in a large bin. Poke a stick into the mix here and there or stir it if you can to eliminate air pockets. Add more material if possible. (Beg your neighbor’s table scraps!) Try laying a plastic garbage bag over the feedstock to cut off its contact with oxygen in the bin. Finally, limit how often you open the lid. Flies or Odors: A dense population of flies can mean that the mix is either too wet or too dry. — Keep a bin of sawdust, wood shavings, leaves or other similar material beside the digester and sprinkle a thin layer over each new layer of food scraps. Bear in mind, that these materials are not easily processed by the digester. Make sure that the additions don’t overwhelm the anaerobic process. Designed for areas with heavy fly populations! 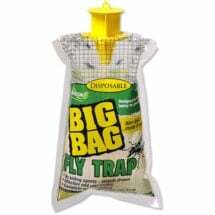 The RESCUE® Big Bag Fly Trap holds up to 40,000 flies and is scientifically formulated to lure all common filth and nuisance flies. Intended for outdoor use only. Contains a fast-acting attractant that starts working as soon as you add water. — DO NOT USE PESTICIDES if you plan to use the compost in the garden. Fruit Flies: The Santa Barbara County handbook (PDF) says dry conditions encourage fruit flies and advises moistening the contents then covering them with a couple of inches of dirt. Soupy Compost: The bin isn’t draining adequately. — If it’s a home-made container with holes drilled in the bottom, lift it out of the ground and completely remove the bottom. Before putting it back in place, dig up the soil for several inches beneath and around it. Mix this dirt with about a quarter its volume of pebbles or very coarse sand, creating a small mound before returning the bin to the hole. If you don’t have pebbles, organic matter can be used, but since this decays over time it will not work for as long as the pebbles will. Pine needles, which decay slowly, would be preferable to compost. Fine sand is not a good substitute for pebbles because in clay soil it can create an almost cement-like compound. This can be avoided by adding organic matter and mixing the materials extremely thoroughly. This is a labor-intensive undertaking. — Sometimes either the labor or the smell involved with removing the bin makes resetting it too awful to contemplate. If this is your situation, try the following: leaving the bin in place, dig out the dirt around one quarter of it, improve its drainage and put it back in place. Don’t remove the dirt from all the way around the bin at once. If the unsupported bin falls over it will create an unholy mess. Next time you empty the bin completely, improve the drainage underneath it. Adding dry material to the bin to soak up the moisture is at best a stop-gap move since doing so will slow the anaerobic process without dealing with the underlying problem: poor drainage. As an immediate short-term solution, add an inch or so of dirt to the bin. Say you’ve filled and closed an anaerobic digester. How long you leave the lid down depends on at least two factors: how concerned you are about pathogens and how finished you want the compost to be. If you’re worried about pathogens, or if you want to remove garden-ready compost from the bin, then leave it closed for a year. On the other hand, if you’re reasonably sure that your materials are pathogen-free, then a few weeks may be all that’s required for the basic composting process to be complete. Just remember that when you remove them, they will be too acidic for plants or their roots. They need to be finished off with an aerobic phase that will neutralize the pH. To initiate this phase, dig the mix into a fallow area in your garden. The earth eliminates odors at once. As soon as the compost is spread out in soil, oxygen and the whole panoply of soil micro-organisms can go to work on it. After two to four weeks, most of the material should have entirely disappeared and you can safely plant above or in it. To check whether it’s ready, either do a pH test or look for remnants of the buried mixture. If there’s any rotten smell left when you dig into the soil, wait another week. The aerobic processes will proceed more slowly in very wet soil so allow for extra time if there are heavy rains after you put the anaerobic compost into the soil.